UNITED NATIONS, May 13 2015 (IPS) - Virtually every major international conference concludes with a “programme of action” (PoA) – described in U.N. jargon as “an outcome document” – preceded by a political declaration where 193 member states religiously pledge to honour their commitments. But over 620 non-governmental organisations (NGOs), a hefty coalition of mostly international water activists, are complaining that a proposed political declaration for the U.N.’s post-2015 development agenda is set to marginalise water and sanitation. The development agenda, along with a new set of Sustainable Development Goals (SDGs), is expected to be adopted at a summit meeting of world leaders Sep. 25-27 in New York. Meera Karunananthan, international water campaigner for the Blue Planet Project, told IPS that with more than 600 NGOs worldwide urging member states to revise the proposed political declaration, it is clear that water remains a very critical issue for billions of people around the world. “Any development agenda is contingent upon the availability of freshwater resources, and as the world battles an increasingly severe crisis in freshwater scarcity, the competition for access is already causing conflicts around the world,” she said. The NGO coalition includes WaterAid, Food and Water Watch, Council of Canadians, Global Water Institute, Earth Law Alliance, Indigenous Rights Centre, Right 2 Water, Church World Service, Mining Working Group, End Water Poverty and Blue Planet Project. “The international community will never achieve its ambition of ending world hunger unless it also tackles under-nutrition, which is caused by unsafe water and poor sanitation,” she said. 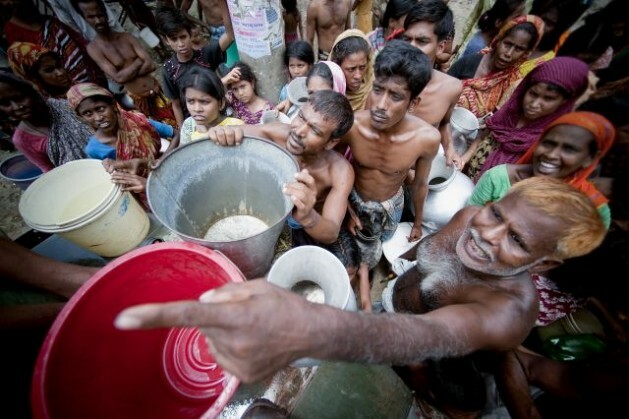 The 193-member U.N. General Assembly recognised water and sanitation as a basic human right back in 2010. Yet, 40 percent of the world’s population lacks access to adequate sanitation and a quarter of the population lacks access to clean drinking water. In a 2012 joint report, U.S. intelligence agencies portrayed a grim scenario for the foreseeable future: ethnic conflicts, regional tensions, political instability and even mass killings. During the next 10 years, however, “many countries important to the United States will almost certainly experience water problems – shortages, poor water quality, or floods – that will contribute to the risk of instability and state failure, and increased regional tensions,” stated a National Intelligence Estimate. Karunanthan said the U.N.s proposed post-2015 economic agenda, which includes a new set of Sustainable Development Goals (SDGs), must not be blind to these predicted conflicts. It must instead be proactive and safeguard water for the environment and the essential needs of people by explicitly recognising the human right to water and sanitation, she said. “If we are to avoid the mistakes of the past which led to the staggering failure of the Millennium Development Goals (MDGs) to meet its targets regarding sanitation, then it is important for the SDGs to be firmly rooted in a human rights -based framework,” she added. The coalition says it wants to ensure the needs of people and the environment are prioritised in any water resource management strategy promoted within the SDGs. “The post-2015 development agenda presents an important opportunity to fulfill the commitments made by member states in 2010,” the NGOs say. The NGO demand builds on the consistent and urgent advocacy done by civil society throughout the post-2015 process regarding the importance of inclusion of the human right to water and sanitation (HRTWS). The Declaration will be a document of political aspirations overarching the post-2015 development agenda, including the SDGs. A draft of the document is anticipated to be released by the end of this month. U.N. Member States have stressed the need for an agenda that is “just, equitable, transformative, and people-centered”. Global water justice groups argue that inclusion of the HRTWS in the post-2015 Declaration is vital to realising this goal. The proposed SDGs include 17 goals with 169 targets covering a broad range of sustainable development issues, including ending poverty and hunger, improving health and education, making cities more sustainable, combating climate change, sustainable management of water and sanitation, and protecting oceans and forests. Goal 1: End poverty in all its forms everywhere; Goal 2: End hunger, achieve food security and improved nutrition, and promote sustainable agriculture. Goal 3: Ensure healthy lives and promote well-being for all at all ages; Goal 4: Ensure inclusive and equitable quality education and promote life-long learning opportunities for all. Goal 5: Achieve gender equality and empower all women and girls; Goal 6: Ensure availability and sustainable management of water and sanitation for all. Goal 7: Ensure access to affordable, reliable, sustainable, and modern energy for all; Goal 8: Promote sustained, inclusive and sustainable economic growth, full and productive employment and decent work for all. Goal 9: Build resilient infrastructure, promote inclusive and sustainable industrialization and foster innovation; Goal 10: Reduce inequality within and among countries. Goal 16: Promote peaceful and inclusive societies for sustainable development, provide access to justice for all and build effective, accountable and inclusive institutions at all levels and Goal 17: Strengthen the means of implementation and revitalise the global partnership for sustainable development.